Please Note: in the above, right picture, comparison, Left to right 450 Rigby, 416 rigby, 450 Nitro Express, 30-30 Winchester. 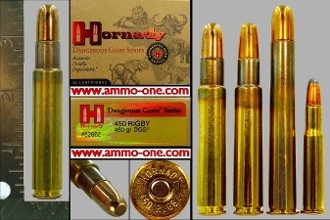 One Cartridge, not a box: 450 Rigby by Hornady Manufacturing Company of Grand Island NE, U.S.A.,newly manufactured 2016 or 2017 using new Hornady brass cases with a "Hornady 450 Rigby" Head stamp and "currently a 480 grain *"DGS" FMJ (Full Metal Jacketed) Projectile. *DGS = Dangerous Game Series. Projectiles mr vary due to supply issues. History of the 450 Rigby Cartridge: The 450 Rigby Magnum was introduced in 1995 by Paul Roberts of the Rigby Company in England. The cartridge is basically a 416 Rigby (introduced in 1911) case necked out to 45 caliber. The cartridge is use in Africa and anywhere you need the stopping power for any living animal on the planet and with a 480 grain projectile traveling at 2,350 feet per second, not much will stand up after it hits them.